Cyclamineus Daffodils are developed from a daffodil that is found growing naturally along streams and rivers in France Spain and Portugal. The species is Narcissus cyclamineus (Narcissus being the Latin word for Daffodil). A small growing bulb that reaches around 15cm in height, the heavily reflexed petals (perianth) are a trademark of most of the hybrids. From this single species many Cyclamineus hybrids have been developed. Over the years this small growing daffodil has been crossed with the larger species, therefore we have a broad range of intermediate sized cultivars. If you are looking for a unique species to grow in the garden or in a container, then this is high on the list. As a result of hybridisation we have many varieties that are around 20 – 25 cm in height. 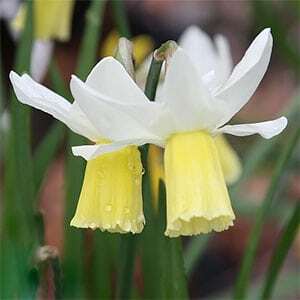 ‘Jetfire’ and ‘Tete a Tete’ are perhaps two of the best known Narcissus cyclamineus hybrids. The hybrid ‘Little Azi’ is a classic example of a white flowering Cyclamineus hybrid. These are an easy care bulb, dormant in summer so little watering is ever required. They grow well in the garden, and can also be grown in containers. 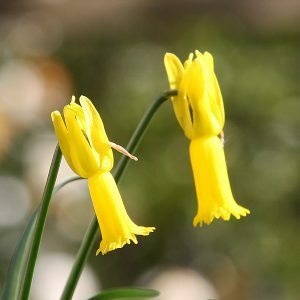 The best time to plant Narcissus cyclamineus is from the end of summer to winter. The bulbs should be plated at around 5cm to 8cms deep. Choose a humus rich, well drained soil. The growing season is spring to early summer and the bulbs need moisture during this period. Remove spent flower heads and allow the foliage to die back naturally. These bulbs will occasionally produce offsets and form a clump over time. When they do produce offsets is easy to propagate Narcissus cyclamineus by division of clumps. The best time to do this is after the foliage has died back in summer. The species itself can also be propagated from seed. Height – Will reach around 15 cm in height. Foliage colour – Mid to deep green.